The Nebraska DOT TAMP is available here. The Nebraska DOT has developed this TAMP to document the current processes, procedures, and methods used to manage its assets. 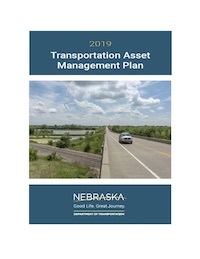 Many of Nebraska DOT’s asset management objectives and policies were already established prior to the passage of MAP-21. This TAMP describes Nebraska DOT’s strategic approach to meet the needs of the system and its users on highways and bridges.